First mistake: It is believed that a number of people stop because they are too anxious or impatient. They tell us the effects of Eleotin® start too slowly. They do not immediately notice any dramatic effects because Eleotin® provides long term beneficial. Please be patient. For example, an uncle of Dr. Kim had to use Eleotin® for 6 months before experiencing any effects. The uncle complained a lot. But after the sixth month, all the beneficial effects emerged suddenly. He could go on to stop insulin injections and other oral hypoglycemic agents. The second reason is that people begin to feel great within the first month or two, and believe this is a sign that they should stop taking Eleotin®. This is very wrong. This is only a sign that Eleotin® has started to work. People should continue to take Eleotin® for at least 4 to 6 months after they begin to experience the benefits. For example, if a patient begins to experience the effects after two months of usage, he should continue to take Eleotin® for another four months, for six months in total. Second mistake: taking too little Eleotin®. Here, Eleotin® simply does not to start to work. There should be a minimum concentration in the blood for the benefits of Eleotin® to kick in. On average, if you make 3 to 4 servings out of each pouch and take it a total of 3 times (1 Blend A, 1 Blend B, and 1 Blend C) a day, you will be above the minimum threshold. At that time, you should eat the sediments too. Many people do experience the benefits at even smaller quantities. However, it is recommended that patients start with small quantities and increase the consumption to the recommended dosage of 3-5 drinks per day (2 Blend A, 2 Blend B, and 1 Blend C). Even if you have taken too little of Eleotin® to experience the effects, nothing harmful that has happened to you. Eleotin® is a safe food. You just do not obtain the desired effect. Other mistakes: Giving up too early. It is believed that a number of people stop because they are too anxious or impatient. They tell us the effects of Eleotin® start too slowly. They do not immediately notice any dramatic effects because Eleotin® provides long term beneficial. Please try to abstain or limit your daily alcohol consumption when you are taking Eleotin®. In fact, alcohol consumption tends to reduce the effectiveness of any herbal treatments. Alcohol tends to wash out the medicinal ingredients of herbs. 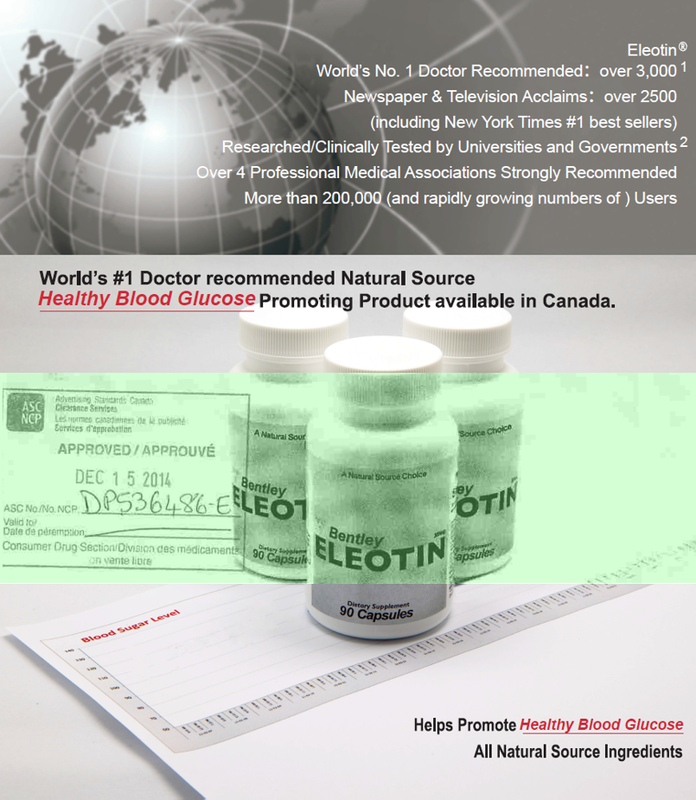 Eleotin® is made from 100% all-natural ingredients. It does not interact with other foods that we usually consume daily. With over 300,000 satisfied customers, there have been no complaints on Eleotin® interacting with other foods. Eleotin® products do not just focus on lowering blood sugar levels and weight loss (i.e. Not narrow-focused), rather they focus more on normalizing the body’s metabolism. Therefore, the patients who had relatively higher blood sugar levels, or were obese, will experience significant improvements after taking Eleotin®. On the other hand, those who were close to normal, or are just beginning to develop symptoms, will be less likely to experience the same level of changes (You can expect to have significant improvements if your overall health condition was bad at the beginning of treatment. Conversely, if you were in a good health condition at the beginning of treatment, you will be less likely to see the same level of changes compared to the previous case). If you were underweighted or hypoglycemic at the beginning of treatment, you will be able to gain weight and your blood glucose level will increase. What our body needs in this case is not a strong stimulus, but proper balance. The strong stimulus that drugs provide usually has a positive short term effect. But drugs, in the long run, can cause drug resistance and lead 16 17 to other numerous negative side effects. We feel that proper treatment would be one that helps all the internal organs and inner mechanisms to function better. This is achieved by gently restoring balance to a body that has lost its rhythm, and its own ability to heal itself. The body can heal itself of most diseases, and in many cases the only thing we have to do is trigger this self-healing ability. In order to do this, we do not need strong chemical signals. The same principle is true for diabetes. Overall, curative actions in our body should occur simultaneously and in harmony for successful treatment of diabetes over a long period of time. The existing drug treatments for diabetes have their limits even though they have demonstrated certain short-term strengths. Diabetic drugs have an effect on only one or two metabolic processes and are not able to help the complex metabolism associated with diabetes as a whole. Because of their concentrated focus, chemical drugs also put a serious strain on the body due to the drug’s cumulative toxicity. They often cause or even contribute to permanent damage of these organs, which may be even worse than the damage caused by diabetes itself. Eleotin® helps to gently regenerate the insulin receptors of muscle or liver cells. Eleotin® also helps to regenerate the insulin producing ß (beta) cells in the pancreas. These two molecular level changes improve insulin production and binding, and therefore; assists the body to control blood glucose levels independently. Complications such as restless sleep, numbness in extremities, and frequent urination are greatly improved by Eleotin®. A general rule for when a person will notice the beneficial effect of Eleotin® is that it will depend primarily on the person’s age and present health. The older the individual and the more severe his/her diabetic complications are – the longer Eleotin® will take. This is no miracle. Your body needs time to heal. You are not able to reverse your hyperglycemic condition that has established itself over countless years in a week. Remember that this is not a miracle fix and so consumers must have a realistic set of expectations. While taking Eleotin®, you should continue to monitor your daily blood glucose levels. When your levels are near normal or have stopped showing dramatic fluctuations, consult your physician. Your physician is the only qualified person to tell you when you should reduce your oral hypoglycemic drugs. Work with your doctor and inform us of any improvements in health. We love to hear from all our customers especially after they have used Eleotin® for over six months. Furthermore, you can expect to feel better according to the severity of your condition. No worries, no damage is done. You can stop safely at any time. The long term health benefits received up to that point are not lost. For example, the regenerated ß (beta) cells or insulin receptors are not immediately lost. Eleotin® is not like other drugs, which once stopped, they develop some resistance so that you have to take a lot more the second time around. Eleotin® is known to have no such development of resistance during and after usage. The blends’ beneficial effects will continue to help the body maintain blood glucose normalcy. If the answer is no, the body has not yet restored its own ability to control blood glucose levels. The temporary effects of Blend A will stop, and the person will experience a rise in blood glucose levels in one or two weeks. Why People Prematurely Stop Taking Eleotin®. It is believed that a number of people stop because they are too anxious or impatient. They tell us the effects of Eleotin® start too slowly. They do not immediately notice any dramatic effects because Eleotin® provides long term beneficial. Eastwood Bio-Medical Research Inc. is doing our best to provide the clients with fundamental solutions to the various health problems associated with metabolic syndromes, specifically diabetes and obesity. It remains as our priority to help our clients until they experience fundamental changes that are permanent. For that sole purpose to be achieved, we would also expect you to put your own efforts and time that are necessary. We are more than willing to provide financial support to deserving individuals who show their strong determination to achieve the goal. There were many of us, whose Blood Glucose Levels are around the border line, and, whose Blood Glucose Levels fluctuate between 100‐150, (5‐7.5 roughly) occasionally. Some of these people used Eleotin®, and Eleotin® appears to be ineffective in lowering Blood Glucose Levels. Also, in case that people were experiencing hypoglycemia (occasional and too low Blood Glucose Levels), people will even see the rise of the Blood Glucose Levels after Eleotin® treatment. Again, Eleotin® is not just a Blood Sugar Lowering agent. It purports to restore the body’s ability to normalize the Blood Sugar Levels. Therefore, if you just look at how much Eleotin® lowered the Blood Sugar Level, and, if you look at those of us who are already normal or near normal, it is possible to say that Eleotin®did not change the Blood Sugar Level for these people. For these people, the benefits of Eleotin®would be mainly preventive and fewer and narrower swings of the Blood Sugar Levels. I thought these cases would not be many, but, in the past, these cases were surprisingly many. We all are aware of the fact that diabetes is exploding globally, and, that this is a deadly disease. However, some people who are overly concerned tend to set some artificial targets for themselves. I do not believe that occasional 150 is such a critically dangerous diabetic case. In fact, some time ago, these cases would be classified as ‘normal.’ The pharmaceutical industry influenced many doctors to lower the criteria so that more people can be diagnosed as ‘diabetic’. If this is the case, I would not worry too much. Keep on using Eleotin® for preventive purposes so that the ‘diabetes’ does not get worse. But, do not be disappointed that Eleotin® does not bring your Blood Glucose Level to 100. If you read the science section of our website, this is well recorded in detail. Even though your Blood Sugar Level is slightly above 100, you really do not have to worry about the complications. Eleotin®seems to bring the people to there. That is why when University of Calgary announced the advent of Eleotin®, they declared that 70% of the users would be restored to ‘near normalcy.’ According to their new definition of “diabetic”, a “diabetic” is a healthy individual who is free from all the complications resulting from diabetes. I hope this would answer your question. Disclaimer : Except for the claims allowed by Health Canada Product Licenses 80000196, 80000364, 80000365, 80000477, 80000481, 80000504, 80000866, the Singapore Health Science Authority CDA (HSU) 40:43/01-B(V), the National Pharmaceutical Administration NPA (CPM) 6:06/1 Vol 19, the Food and Drug Administration Authority (Republic of China) 0900027995, the Food and Drug Administration Authority (People’s Republic of China) Import Food Hygiene Supervision and Inspection Bureau Certificate 990067, the Food and Drug Administration Authority Approval Number J20060001, neither Eastwood Bio-Medical Research Inc., its affiliated companies, its employees, its distributors, nor its personnel make any claims that that products manufactured by Eastwood Bio-Medical Research Inc. cure, diagnose, or prevent any diseases.